I’ve been using individual silicone baking cups for years now, and it’s past time to update this post featuring them as one of my Kalyn’s Kitchen Picks! I’m sharing a tip about my favorite brand, plus links to all my favorite breakfast treats using these handy silicone baking cups. I have a little notebook where I jot down ideas for recipes and other ideas for posts, and a few months ago I wrote “silicone baking cups for Kalyn’s Kitchen Picks” as a post idea. But when I started working on that post I discovered I’d actually featured these handy silicone baking cups as a pick back in 2008! Since then I’ve tried different sizes of silicone baking cups, found a new favorite brand, and posted quite a few more recipes for egg muffins, cottage cheese and egg muffins, and whole wheat and almond flour muffins using this type of baking cup. So I’m updating this post with all that information, and if you’re already a fan of silicone baking cups this post will give you lots of breakfast ideas using them! I now have three sizes of baking cups, and it can get confusing because different brands call the sizes by different names. But my smallest size is about 2.75 inches across and holds 1/3 cup, my middle size is about 3.5 inches across and holds 2/3 cup, and my biggest size is about 3.75 inches across but deeper than the others and holds 1 cup. There is no need to stress over having a certain size of baking cups though, it’s really a personal preference. Just realize that when you’re using a smaller size the baking time might be a bit shorter and when you’re using a larger size the baking time might be a bit longer. These Chambers Bay Baking company Baker’s Dozen Silicone Baking Cups are my current favorite! I love the lighter colors and the fact that they give you 13 cups instead of 12. They don’t get discolored, and when sprayed lightly with non-stick spray they release things perfectly. The Chambers Bay Silicone Baking Cups come in two sizes. STANDARD SIZE are the smaller size I described above, and JUMBO SIZE are the medium size I described above. Jumbo size is the one I like best in the Chamber’s Bay cups. Just in case anyone is wondering, Chamber’s Bay has no idea I’m writing about their muffin cups. If you do follow one of my links and buy muffin cups at Amazon, Kalyn’s Kitchen earns a few cents on the dollar, so thanks for that! Now here are the things I’ve made using Silicone Baking Cups; enjoy! Visit Kalyn’s Kitchen Picks to see more foods and kitchen products I’ve recommended. (All items featured as Kalyn’s Kitchen Picks are things I happily would buy over and over, and because I want readers to know that my opinions are completely unbiased, I don’t accept review products from the many companies who offer to send them to me. 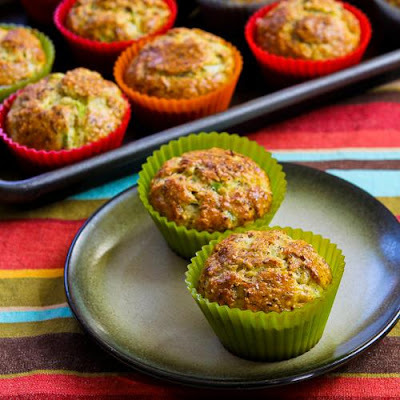 How do You like to Use Silicone Muffin Cups? There you have all my tasty ideas for using your silicone muffin cups! I’m sure more recipes using these handy baking cups are in my future, so I’ll keep this post updated with the recipes when I have new ones. 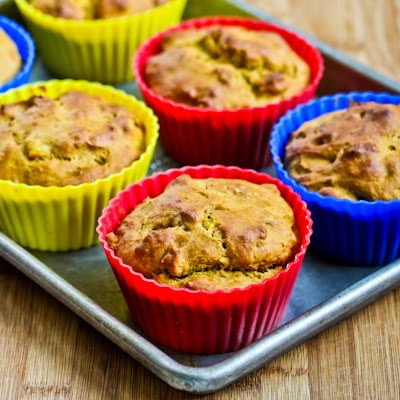 If you have good ideas for recipes using silicone muffin cups, please let us know about them in the comments. Use the Recipes by Diet Type photo index pages to find more recipes from Kalyn’s Kitchen that are suitable for your specific eating plan. You might also like to Follow Kalyn’s Kitchen on Pinterest to see all the good recipes I’m sharing there. I consider it to be completely safe. But everyone should make up their own mind about this kind of thing. If you’re concerned you might want to google it and see what you decide. I'm thinking of using these to replace my rusty old muffin pan. 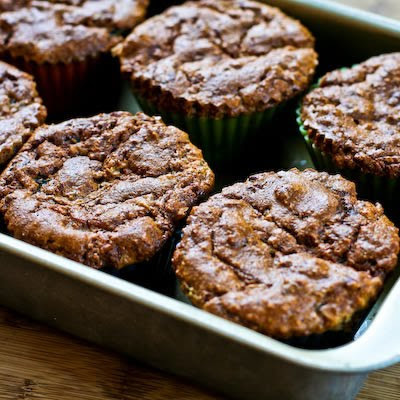 Can I bake with the silicone cups just on a flat sheet pan, or will the muffins flatten and spread? 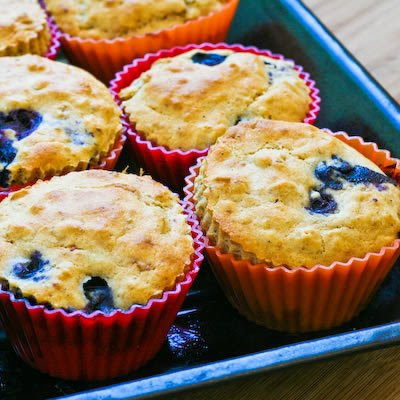 Yes, you can definitely use the silicone muffin cups on a flat sheet pan. I don't know if my comment went through. Question. Using the Jumbo cups (if not bigger) do you have any ideas about "lunch" muffins? Walter, I didn't see another comment? 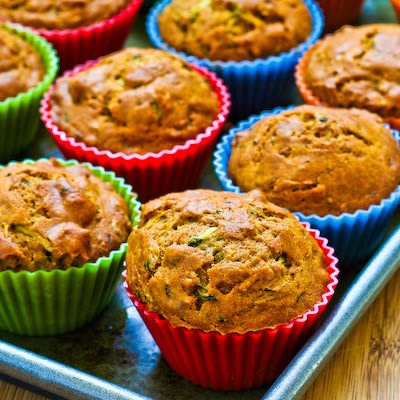 The ones listed in this post are the only muffin recipes I have, but these could be eaten for lunch. Dear Kalyn, I love your recipes and website. I am trying to follow the southbeach diet, but can't seem to make it through phase… do you have any tips or suggestions? Would love it if you could expand your website services to offer phase 1 support! Hi Gloria, Glad you are enjoying the site. I realize Phase One can be challenging. I'm not going to change the format of the site, but there are some resources for Phase One on the page for South Beach Diet Information and Resources. There is also an index of all the Phase One Recipes and a photo index of all the South Beach Diet Phase One Recipes. Hope that helps! I bought these and used them once and the food got stuck to them and nothing I did got them clean. I was very disappointed. I always spray them with non-stick spray just for extra insurance against sticking. I've had 3 or 4 different brands and never had that problem. Sorry you got a bad one. Deborah, they’re fantastic. You won’t regret buying them. Med. Kiwi, I do eat my breakfast ones right out of the cup. Mrs. L. great to hear you’re liking them. I actually went out and bought some of these last year specifically to make the breakfast muffins on your blog. Made everything so much easier as the paper ones just were not working for me. I use them for everything now. 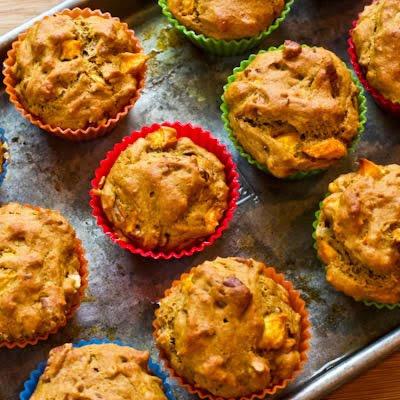 i love the different colours of the muffin tins – and they could act as your serving plate! These cups are so cute and I almost bought some the other day, but now you have inspired me to go back and infuse a little money into the economy! Nancy, they are completely easy to clean. I just rinse them with warm water most of the time. More fans for these, thanks for sharing. Cheryl, I haven’t noticed any odor with these. I think the other muffin tins had a funny smell the first couple of times I used them, but not now. Thanks again for the Target recommendation. Definitely will look for them. They have a dollar section at every Target when you walk in the store. I found individual baking cups very similar if not probably the same kind for $1.oo/set of 6. I tried them out and they are awesome. I would recommend them if anyone can still find some. I’ve been on the fence about silicone. Do you get a funky odor? I know my silpat outgassed for quite some time. I fully agree – they are such great things. And come in wonderfully vibrant collours. Anonymous, I go off it myself once in a while (like right now when I’m on vacation!) That’s one thing I love about South Beach, how you can get right back to it so easily when you need to lose a few pounds. Glad you like the blog, thanks for he feedback. My husband and I go on and off of south beach often. We are not overweight people, but occasionally, we “fall off of the wagon” and need to get back on. So, we are going back on South beach this week. I am always on the internet looking for new, “jazzed” up recipes and luckily, I came across your web page. I absolutely love your web page. Keep up the good work! Been out exploring Boston all day with Lydia, so just got most of these comments. 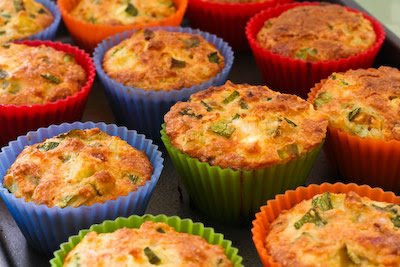 Sounds like people are mixed about the silicone muffin cups.I don’t know how the silicone is for baked goods, but it’s great for the types of egg-based muffins I use them for. Biggie, will be going to Target right away to check on that bargain! I always wanted to try these, but I am concerned about whethere or not things like this leach chemicals into the food. I think I will be purchasing cast iron muffin pans instead. They are so cute. I’ll look around if we have these in town. Thanks for the tip. Have a wonderful Sunday! I’ve really been on the fence about baking with silicone, but I like the cups because they create less waste. You can get them at Target, Safeway and Japanese discount stores (like Ichiban Kan) that sell bento supplies. Probably cheapest at the latter. I’ve not been a fan of silicone for baking but picked up a set of these for $5 at my grocery store this week — and did indeed note your photo earlier in the week, so am glad to know they’re a ‘pick’. My local WalMart has them, too. I have always wanted to try them because I love my silicone muffin pans, but was afraid that the cleanup would be a nightmare. I am headed to WalMart to pick some up today. Thanks for the tip!